First if you want to win this little bird leave a 'greenie' comment here or on the post below. It's still hot and dusty here in the Vegas, and it's the best weather for fruit eating. I went to the West End markets this morning for a chai, some fruit and a good gander. The operation love roll is still rolling along, with the hearts at stage 3 of the lacquer process. I have also made some really cute little envelopes to pop them in when I hand them out to the sushi goers. Good luck with the love drop! 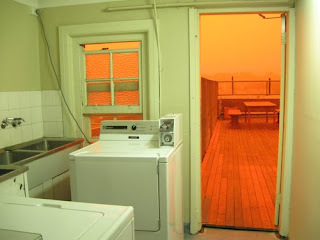 Your pic of the dust storm is great. mmm papaya! I can't enter the contest but that brooch is super cute. Great photo! I'm the same with fruit at the moment - can't get enough mangoes, rockmelon and green papaya salad! Yay! I bought a brooch.